Chocolate is officially in the air on Discovery Street! I’m planning to launch a Science of Chocolate Walking Tour in late summer or early fall. Today I visited the aromatic factory of Dandelion Chocolates, located in Dogpatch right now, but soon moving over to the Mission. 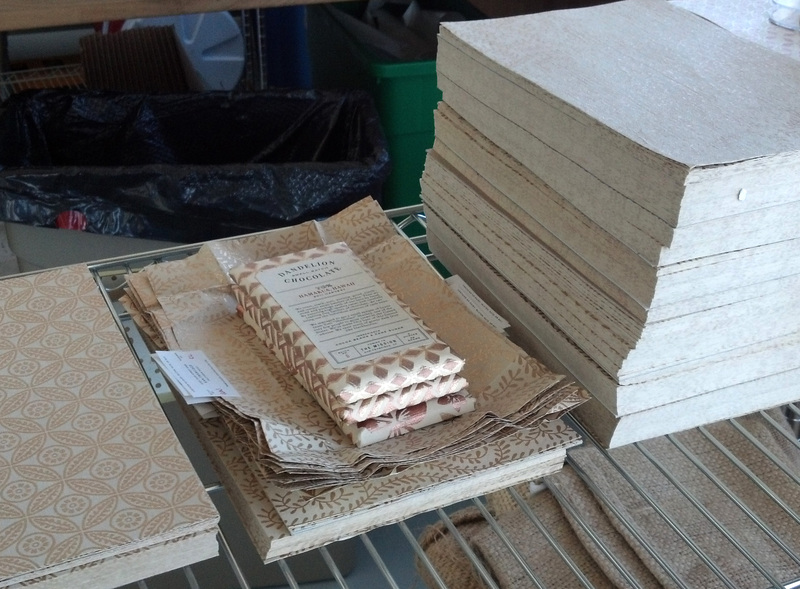 Alice Nystrom, one of four Dandelion folks, gave me a tour of their chocolatey digs, including some velvety smooth samples. Here’s a preview for y’all, to get your curious taste buds anticipating. 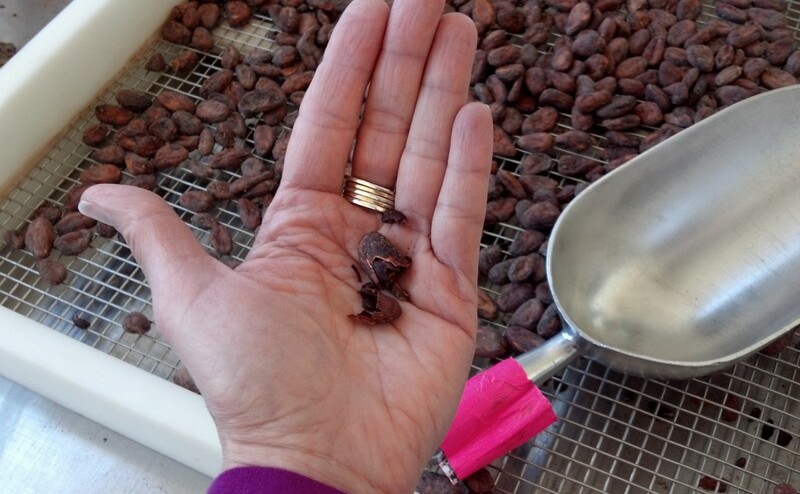 It all starts with the raw cacao beans. Here’s one cracked open in my hand. These beans came from Madagascar. The beans are roasted in small, 1 kg batches, cracked to break them into pieces and remove the husks, and then the nibby bits are ground up in a peanut grinder. After that, they’re moved to this machine, where the cacao nibs are mushed around with some sugar, a process which goes on for a couple of days. 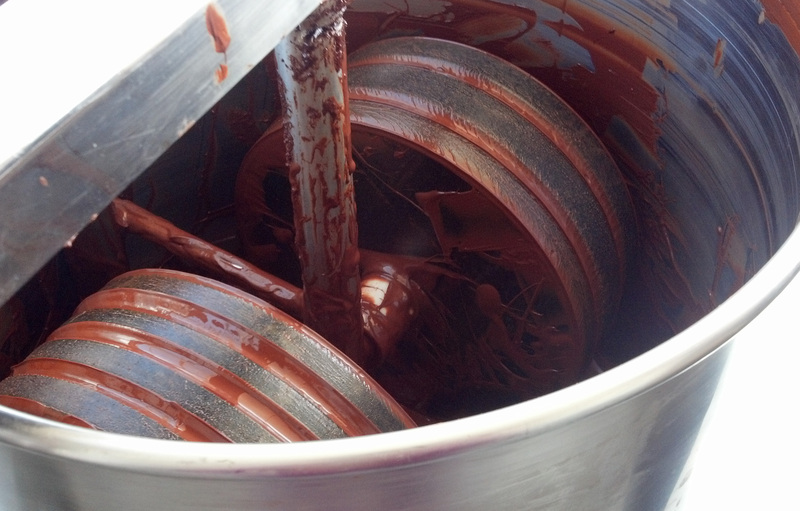 Then the real science comes in…tempering. Below is a picture of the tempering machine. Tempering is a way of coercing the fat in the chocolate to make the right type of crystals (mmmm, fat crystals), the sort that will give the final bar a nice shine and snap. 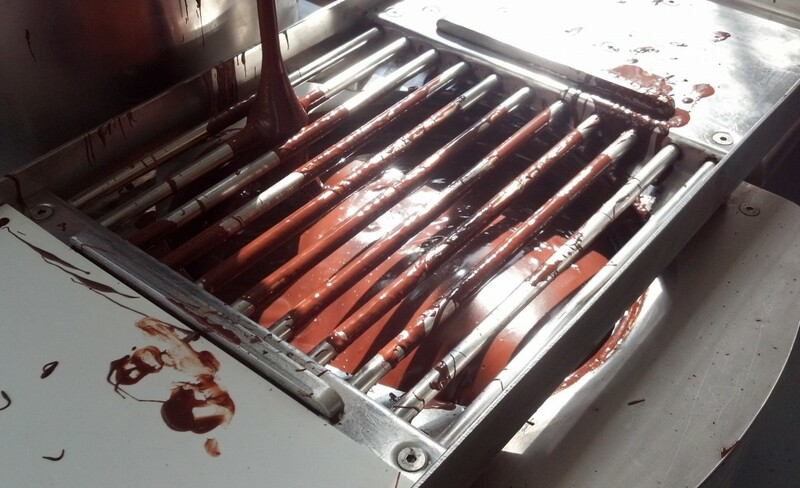 After tempering, the molten luscious lava is poured into molds and chilled. Lucky visitors to the factory get to sample some tastes. Dandelion uses only cacao and sugar in their bars, a very unusual approach to chocolate-making. 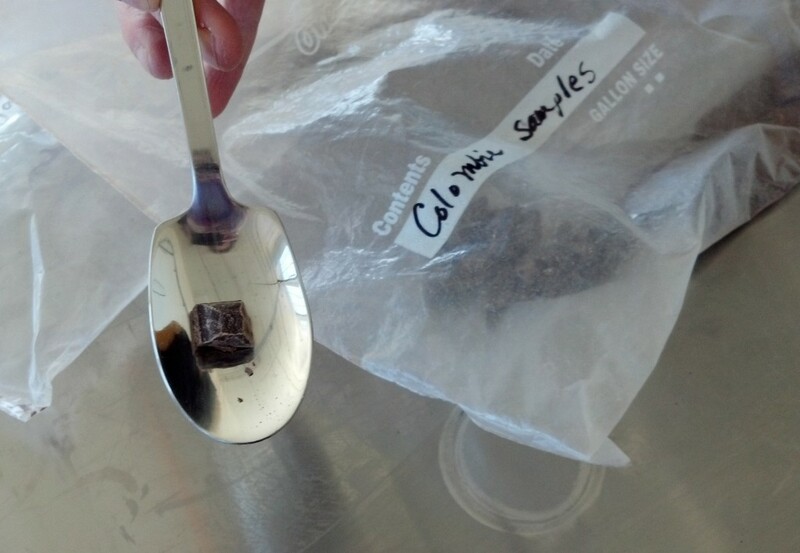 The creaminess and flavor notes of the chocolate reflect the pure bean’s fat content and unique biochemistry. And my oh my, what fine chocolate it is! At Dandelion, they wrap each bar individually by hand, with loving care, and seal it with a sticker bearing the wrapper’s initials. 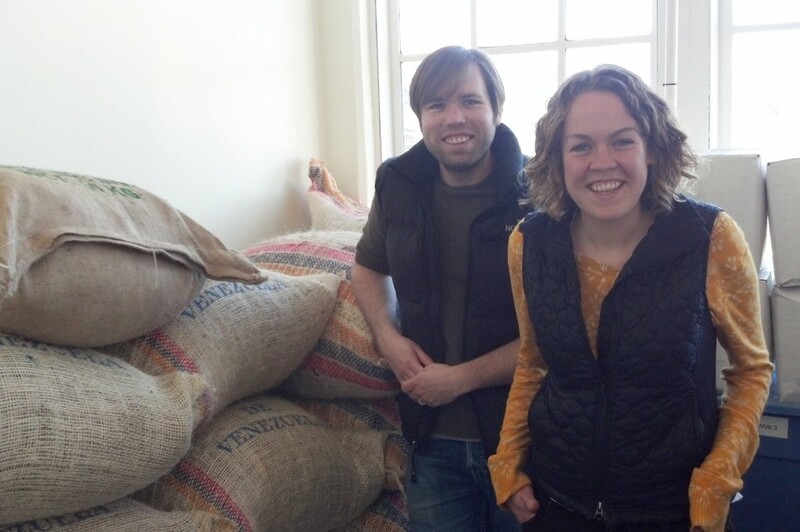 And last but not least, two of the smiling faces behind Dandelion, standing by bags of Venezuelan beans: Todd Masonis (pictured here, left), along with Cameron Ring, founded Dandelion Chocolates in 2010. My tour guide Alice Nystrom (right) joined them about 18 months ago. In February, Alice hand-wrapped the company’s 10,000th bar. And we know there are many more to come! I’ll be launching The Science of Chocolate Walking Tour shortly after Dandelion moves to its new home on Valencia St this summer. Join the Discovery Street mailing list to hear about preview tours and the official chocolate launch!